Father in Heaven! Hold not our sins up against us but hold us up against our sins so that the thought of You when it wakens in our soul, and each time it wakens, should not remind us of what we have committed but of what You did forgive, not of how we went astray but of how You did save us! I don’t know what you know about Søren Kierkegaard. This is Prayer Four of his prayers. He was hardly what we would call a confessional Lutheran, but I have a great appreciation for him. Whatever his faults, he had conviction. A Danish philosopher with a deep distrust and disdain for the state church of his day, and rightly so in many ways, even when dying, he refused Communion from state church pastors, protesting that he didn’t want the Sacrament from bureaucrats. Kierkegaard wrote a book called Fear and Trembling. In it he wrestles with Abraham’s call to sacrifice Isaac. He wrestles with whether faith transcends ethics. That’s an interesting question, but I won’t belabor you with it now. Anyway, though, Kierkegaard does something fascinating in that book. He attempts to take us through Abraham’s mind as the patriarch prepares to sacrifice his son, his only son, his son whom he loves. Part of the reason this draws me in is that I think we get the point of that biblical story wrong all too often. I often joked with my Sunday School teachers, when this story was coming up, that God stopped Abraham from killing Isaac and we should pray he stops us from murdering this account. What’s the temptation? We’re tempted to make it all about Abraham’s faith. Abraham becomes an example. We should believe like Abraham. And we stop there. But should we? What is the real, chief, most Christian message of that account? Is God preparing us for Abraham’s life or ours? Isn’t it that God’s promise transcends everything, that God provides? 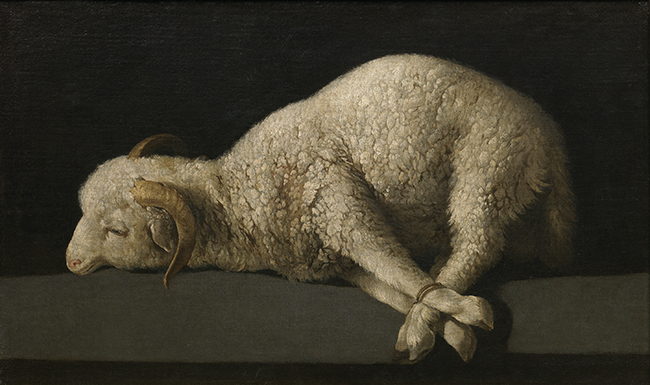 “God Himself will provide the Lamb”, Abraham said. So what do you think Abraham was thinking in that moment when he raised the knife to slay his son? Do you think he had that joy, joy, joy, joy down in his heart? Do you think he was overcome with faith? Do you think he had a particular “heart for God” in that moment? I wonder about that a lot. I tend to think he felt abandoned, near despair, full of anguish, the opposite of everything we tend to associate with strong faith. God had probably never seem farther away, more hidden. All he had was God’s promise in that moment, that all nations would be blessed through his son, presumably, through Isaac, that God would be with him, that the salvation of all people would come through his loins. He had that and nothing else but a bound son about to become a burnt offering, the stench of his cooking flesh filling his father’s nostrils. He had God’s promise. He had God’s will. And he had to totally abandon his own. He was free—completely free! Why? God had taken everything else. Abraham’s wanting had ceased. He couldn’t want the death of his son. This wasn’t a sacrifice he could make. Believing had taken control. God had provided, and God would provide. I wonder if Abraham ever loved his son more than when he unbound him, when he received him back as a gift. It is a wonderful freedom to receive gifts, to recognize all as gift. Gifts are meant to be enjoyed. And gifts are signs of the Giver’s love. Gifts indicate, not obligation, but affection. Gifts open our hands to receive. Gifts fix our eyes on the hands of those who give them. We fell through the devil’s appeal to our will—Adam and Eve knew God’s command, but they wanted what the devil was selling—and it is only through our death to our will, our death to slavery to it, to death itself, that we come to life. As sinners dead in trespasses we are free to choose choices of all sorts in a dying world, to choose death among the dying, but we cannot choose life. God must give it. He must give it, contrary to our will. And Jesus makes that clear in His Holy Gospel: “Jesus answered them, ‘Truly, truly, I say to you, everyone who practices sin is a slave to sin. The slave does not remain in the house forever; the son remains forever. So if the Son sets you free, you will be free indeed’” (John 8:34-36). Christians are a people of freedom, and not the freedom of existentialism or democracy—although there can be good in both—but the freedom only God can give, true freedom, a call out of the slavery of our will to the freedom of slavery to Christ. The truth is we are slaves by birth, and free by birth—slaves by birth into sin; free by Baptism into Christ. The truth is that God’s promise has taken hold of us and refused to let go, so that, even in the midst of the most unbelievable burdens, when it even seems God is against us, God is for us and can never be otherwise. What are you going through at the moment, whether at home, work, church, or wherever? Where has God’s promise taken you captive, distant as He may seem? Where has God put the knife in your hand? Is He asking too much of you? Of course He is. It’s always too much. We can never do enough, let alone do it all. We can’t do, we can’t choose, we can’t earn, not when it comes to our salvation, not when it comes to our standing with Him. No, in those darkest of moments—indeed, in any moment, but especially in those—God leaves us with nothing more than His done, chosen, earned, given, credited, which is received through faith, His gift to those taken captive through and to His promise, and He makes that our everything. Rejoice to have everything! Rejoice to be true children of Abraham, through faith, to be free!